Duncan: That looks a bit like Draenor. So this is like an early piece of Draenor. One of the things that we needed to work out is where the story takes place and how much of it takes place in each location in order to really give a sense of the grandness and scale of the world. This is an environment, obviously. We felt very passionate about making sure it was in there. Duncan: Anybody recognizes that? This is another piece. It’s Dalaran. One of the things we should really mention is the amazing team that we have around us working on this film. The production designer of the team is Gavin Bocquet (IMDB)– who has worked in a number of Star Wars films, ironically. 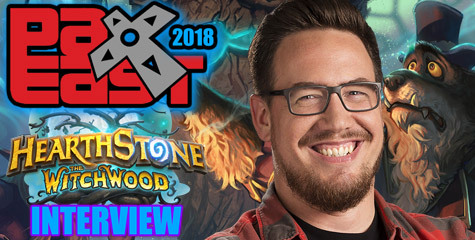 Duncan: Also with Blizzard artists, as well. It’s a number of artists we got from you guys. Westenhofer: Nick’s team has been great. Helping. Bringing in a lot of the DNA from Warcraft. In particular, Wei Wang, lending a hand on the design of creatures for us. It’s really incredible to see the detail and the work. Now, you’re going to see it is as if this world existed first and what you have been seeing all along is an interpretation; and you are going to see a real orc. It’s pretty awesome. Carpenter: Yes, we had a chance of working with you guys, and realize this vision, and from what I have seen this is not going to disappoint. It looks like a Warcraft feature film. And it is mind-blowing. 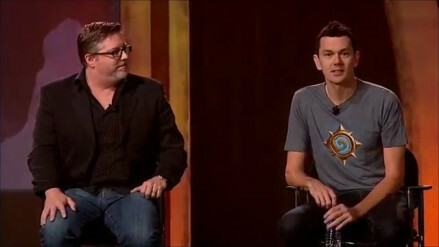 Duncan: Here’s a little bit of Iron Forge. 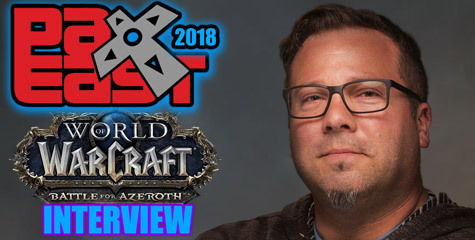 Metzen: It strikes me. One of the really interesting things to have watched over the past six months as Duncan’s team has been doing a lot of design — I had a little bit more visibility on what Nick’s group has been doing. 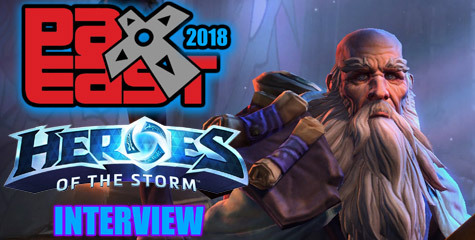 It strikes me that when we’re just doing this work, let’s say we’re building an expansion set or just working on the game, like it is so often we’ll have a vision, or an idea. Like Dalaran, or Iron Forge, or any of these places. And when you are building it for purposes of a video game, you’re kind of constricted by how many polygons you can put into a scene, how you block a scene, player traffic and flow through a city — there is just so many design constraints, or design strengths, really. It kind of demands things of your vision. Oh, we have to put a window here, we have to take out this hallway and do this. It’s kind of an exacting science, so one of the really fun things about watching this production process go has been that these guys have been kind of freed to kind of capture the vibe of these areas that kind of exploded out a little bit. Make them feel more cinematic. Make them feel a little more lived in and little bit more grand than what we can literally do in the game. Like that Alliance? And feel like home? Westenhofer: And not to make you jealous, but I had a little geek out moment when I realized I was going actually to be standing in Iron Forge and in Stormwind. So that I am pretty excited about. Duncan: One of the most fun things for us about working on a film like this, at the scale we are doing it at, is we actually get to physically build a lot of locations in the film. Westenhofer: So you mentioned Lion’s Pride Inn — so everyone, on the Alliance side, one of the first things we saw was the Inn in Goldshire. Duncan: You can just imagine what our production party is going to be like and where it’s going to be. 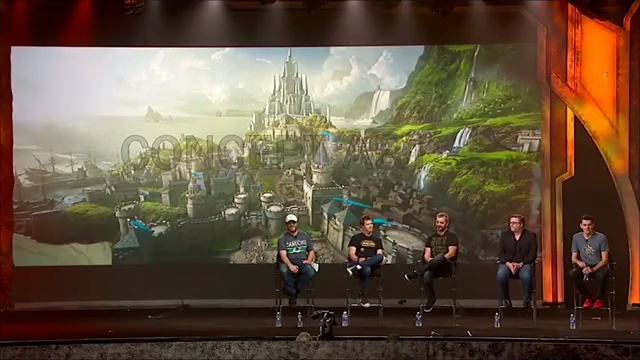 Metzen: Looking at a lot of these big marquis areas, which is super exciting. Just things like, no, we’re going to plant a shot at the Lion’s Pride Inn, it is like I have almost spent more time, like in Goldshire after X number of characters over the years, it is so familiar. 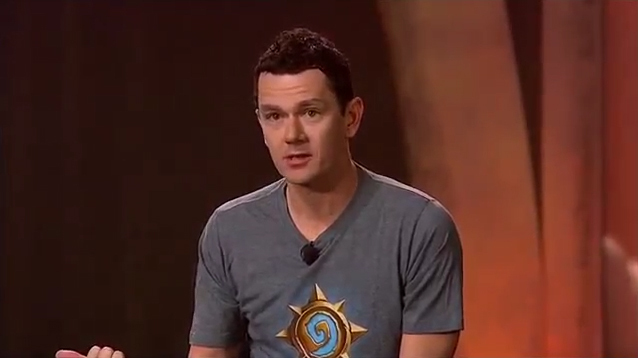 It is just the grass roots of Warcraft. There are obviously places like that all over the world, but I love that this potentially takes us to more intimate spots as well. Almost familiar, right? The one thing — I don’t know if I have ever said this before guys, but I think you would all agree, is that when we talk about Warcraft — we talk about this big franchise, the main characters, or the plotlines or some of the big chapters that have come before — but the trick is you know what character is most famous in World of Warcraft to all of us? The character that is most famous is the world itself. You might have met Thrall. And you might have fought the Lich King. And you might have found Hogger over there in Elwynn, but I guarantee you we have all spent X number of hours in The Barrens and Westfall, and it is almost like the place, the trees, the roads, the vibe and the color palettes — actually most of the engagement we have had is literally in the world itself and that’s really been a major value of ours is in translating the film, making this film cinematic, is finding those values. It’s almost like — Do you remember guys yesterday, when we were talking about the player models like — “don’t break it”. It is the point of maximum familiarity, sure you can reanimate everything. Sure, you can blow the polygons out, but it is not where the flavor is, it’s not where our hearts are, the visuals we’re so connected to. So that value is critically important that we can kinda pull out some of these areas for maximum familiarity just feels right. Even though it is a little grander for story telling purposes. 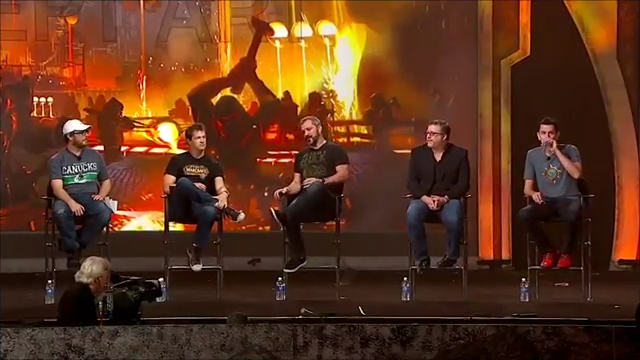 Pardo: So Duncan, you kinda mentioned that one of the other people that is not on stage has been working on the film, but maybe you guys can tell the audience here about some of the other people who are working on the film and — I kinda reassure them that Warcraft is in good hands. Duncan: Absolutely. One of the people that I wanted to mention is Mayes C. Rubeo who is doing our Wardrobe costume design, and that has become an incredibly important and interesting puzzle for us to solve because almost half our cast is live action and real, in that very traditional root. but with half our cast being virtual, being performed by actors but using the motion-capture technology — how do you actually approach that as far as how you costume those characters. So even though they’re not actually going to be performing in the costume, we actually had to have them for photographic references so we can actually see on camera what those costumes look like, how they move. How gravity affects them. We actually started making all costumes at full scale. Mayes has worked on Avatar and also Apocalypto , as well. So I think for what we are trying to do she is just the perfect person for that. Westenhofer: That is the level of detail we’re after and seeking, in getting down to how riveted the patch is, how the leather straps are weaved in. By building it real, we’re getting that stuff as detailed, and interesting as possible. Pardo: So it is probably safe to say that Mayes would always win the costume contest of the year? Duncan: Absolutely. I’m working with Paul Hirsh, he is the editor I worked with on SOURCE CODE and he has an amazing body of work. He worked on Star Wars Episode V – The Empire Strikes Back . Won an Oscar, he was in Ferris Bueller’s Day Off . He has a crazy collective body of work. He is an institution in the industry. An amazing editor. Pardo: Well, maybe Bill and Nick, maybe you can talk a little bit about what it is like to try to translate Warcraft and the visuals. I know you talked about it a little bit. But obviously it is going to be a really big challenge to make the orcs and do orcs that have acting. How you take these goofy cartoonish-looking characters that we create and make them photo-realistic for Warcraft (the movie). Carpenter: Funny enough. In the cinematic department we do it all the time. We work with the game team and try to translate that into much higher resolution space. So when we had the chance to be a part of this. The discipline is very similar. They’re just going so much further. Like I was saying, we have seen all these spaces, we’ll make a concept. Wow, seeing it from game and actually translate to concept and then what these guys are going to do with that? It is just absolutely amazing. And I can’t tell you guys enough, you’re absolutely in the right hands. Trust me, this guy is going to make an amazing film. Westenhofer: We want to do it as much justice as possible. And we’re — you know, we’re pushing the technology, we are doing on-set motion capture, a lot of technical jargon, but it is the kind of thing we really — the orcs are not just going to be bad monsters, they are going to really act, they will have personalities. And the level of details, we’ll go to lengths to build the real costumes. We’ll build the full-size casts to get all the details just right.